You might have noticed a deafening silence coming from this obscure stop on the Information Superhighway. It has been more than a month since my previous blog post, which is nearly unheard of for me. I might go a week to two without blogging, but rarely a month! In fact, one of my readers was concerned enough to text me and ask if everything was okay. Yes, everything is fine. I was really, really busy last month finishing up my new book Discovering Design with Chemistry. Things are still on track for it to be released on August 17th, so that’s good. After I got done submitting the final pages of my book to the publisher, my wife and I then left the country for two weeks to celebrate our 30th wedding anniversary, which was actually last year. We had a wonderful time and just got back into the country. Physicists have found a long-predicted twist in light from the big bang that represents the first image of ripples in the universe called gravitational waves, researchers announced today. The finding is direct proof of the theory of inflation, the idea that the universe expanded extremely quickly in the first fraction of a nanosecond after it was born. 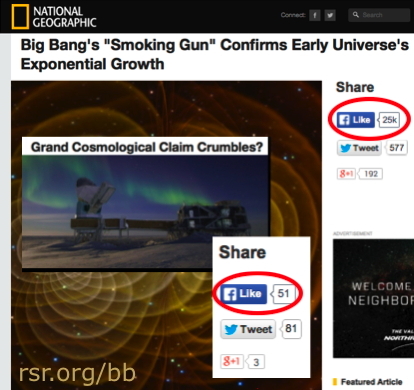 So, according to Scientific American, the BICEP2 experiment proved inflation! Space.com said the data were the “Smoking Gun” of inflation, and the New York Times agreed. Of course, there were other news outlets that were more responsible, including the fact that the results were tentative and not yet peer reviewed. Nevertheless, the overall coverage made it seem like the research team had confirmed that cosmic inflation really occurred. A few months after the media storm, I gave a talk at the University of Michigan, and the session is in the YouTube video at the top of this post. I am the second speaker, and I start at 16:30. Don’t worry about watching the entire thing, because the important part for this blog post starts at 48:48, when I am doing my favorite thing, which is taking questions from the audience. Someone asks about the BICEP2 results, and in about three minutes, I explain why I think the data are wrong. I further predict that the data will eventually be shown to be wrong, probably because the experiment did not account for dust properly. My prediction turned out to be correct. In April of 2015, a definitive paper showed that the BICEP2 result can all be explained by cosmic dust. Now please understand that this wasn’t a hard prediction to make. Indeed, about a month before I answered that question, several astrophysicists had published some data to indicate dust was the cause of the result. Thus, I am not saying there is anything special about my prediction coming true. It was the most likely explanation of the BICEP2 results. However, I am interested in the second prediction I made. I said that when the BICEP2 data are shown to not provide evidence for inflation, the media attention will be much lower than when the data were thought to provide evidence for inflation. I am not sure that prediction came true. For example, Scientific American, Space.com, and The New York Times later ran stories indicating that the data were not evidence for inflation. Thus, I am wondering what you think. Had you heard about the BICEP2 results supposedly confirming inflation? If so, did you also hear later that they were shown to not be evidence for inflation? If you followed the story at all, do you think the original result got more, less, or the same amount of coverage as the final result? I read several articles about the results of the experiment and they all seemed pretty fair about the results, which I was surprised about. Notwithstanding, the results have done nothing to change the way the early universe is taught as if it inflation was a stone cold fact anyway. Question: Do you think how complex and high level some of our science is today that it is inaccessible to the layman? There seems to be some similarities between the illiteracy in the middle ages and the abuses the catholic church could perpetrate due to the inaccessible knowledge and the scientific illiteracy of the general population. We just don’t have the means to challenge some of these conclusion and we have accept the truth given to us. Poor analogy? I think it is a bit of a poor analogy, Tim. Today, information (even detailed, specialized stuff) is much more readily available. In addition, humanity is significantly more educated, and it is easy to contact specialists when you get confused. You can even take free online classes on very detailed subjects. As a result, if someone really wants to investigate a scientific issue, he or she can do it, as long as the will to work hard is there. At the same time, however, I will grant you this: Most people are not willing to work hard to find the scientific truths that are out there. Most people are content to believe what they are taught (or what the majority of scientists say) so that they don’t have to investigate things on their own. Because of that, the “high priests of science” hold a lot of sway. The thing I don’t understand (I am only a lowly software engineer, after all), is why the uniformity of the CMB is such a big “light travel” problem. Is it not simply possible that the physical properties of the BB expansion were such that the heat/energy of the universe was uniformly distributed across the fabric of space? That would seem to me an obvious, even likely, conclusion. In other words, if the energy distribution were nearly uniform from the inception, it would fairly naturally remain so after any amount of expansion. And it seems to me that in any given volume of space the energy distribution is naturally uniform unless there is a localized heat source — which there is not when talking about the expansion of the universe; the heat “source” is the entirety of space. Think about time and scale in the Big Bang, Lawrence. Supposedly, light in the CMB from opposite directions has traveled 45 billion light years to earth since the Big Bang. Extrapolating that back using the current model without inflation, this means that the light coming from one direction to the earth was 40 million light years away from the light coming from the opposite direction when the CMB formed. However, the CMB supposedly formed 360,000 years after the Big Bang. Since the maximum rate of communication between two systems is governed by the speed of light, two regions 40 million light years apart couldn’t possibly be in communication with each other. Thus, the chance of all of the parts of the CMB being so similar is incredibly low. Thus, you have to have some expansion model that allows the universe to stay in thermal equilibrium when its parts can only interact at the speed of light, at least up until the CMB forms. That’s why you need inflation. Even if the universe started out in perfect equilibrium, expansion would upset that equilibrium, and the only way it could be maintained is for all parts of the universe to be thermally connected. But doesn’t that rather make an argument for the expansion rate being slower than C for at least 360KY, until sometime after the formation of the CMB? Which seems to fit with the theory that expansion is accelerating? You’re not being dense, Lawrence. These are arcane matters, for sure. The problem is that you are dealing with a system that is expanding with time, and that expansion, of course, affects the travel time for the light you are trying to observe. Also, the conditions of the system affect the way that the different parts of the system stay in equilibrium. Let’s put it this way: The light from opposite directions in the universe is 45 billion light years apart now. At 10-34 seconds after the beginning of the universe (the Grand Unified Theory era), we need that distance to be 6×10-26 meters in order for all parts of the universe to stay at equilibrium. Remember, the conditions at this point were supposedly much different from what they are now, so the interactions between different parts of the universe were different from what they are now. Based on what Big Bang advocates think were the conditions during this time in the universe, that is the interaction distance needed to maintain equilibrium. The problem is that the events which supposedly happened during the evolution of the universe depend on energy density, and in order to get the needed energy density at 10-34 seconds, the universe had to be a mere 3.3×10-44 meters across when it started. However, to get from 3.3×10-44 meters across at the beginning to 6×10-26 meters across by 10-34 seconds, the universe had to expand faster than the speed of light. Of course, its not doing that now, so there had to be some period of faster-than-light expansion to get the universe to the correct size at the correct time. That’s inflation. Now by “inflation”, are we just talking about the idea that space itself is expanding, or we talking about the period of super-rapid expansion that supposedly took place at the start of the big bang? My understanding is that the current rate of expansion is much slower than it was at the start of the big bang, hence the deeming of this early time as an “inflationary period.” Is this correct, Dr. Wile? I don’t think I’ve heard of the BICEP2 results before reading this post. I have heard a lot about redshift and cosmic background radiation however, which are put forward as evidence for the big bang theory, which comes with the inflationary period as a package deal. By way, in your opinion Dr. Wile, does YEC have any problem with the general idea that space itself is expanding, apart from the big bang theory as a whole? YEC doesn’t have a problem with the expansion of the universe. The two major YEC cosmologies that exist today (Humphreys’s and Hartnett’s) both utilize universal expansion. There are even Biblical hints that the universe is expanding. Job 9:5-8 and Psalm 104:1-2 both talk about God stretching the heavens. I remember seeing the Scientific American article about it since I subscribe to their online posts (something which I question almost daily). I also remember Facebook telling me that the story was “trending” for a while as well. I did see the second Scientific American article on the subject, but Facebook failed to tell me that this story was trending. That would tell me that people/organizations were much more enthusiastic in sharing articles confirming inflation than the ones showing the error, but I have no idea how many actual media articles were written one way or the other. Thanks Aaron. That’s an excellent way of trying to gauge things! My experience of all this was atypical, as my department was right in the middle of everything… It seems to me like there was far less coverage of the dust explanation after the fact, but that was probably because I was surrounded by high levels of excitement, disappointment, and controversy when the BICEP2 result first came out. Being inside the community (well, on the floor in between it) meant I knew about the problems with dust from the beginning – especially since many of the people around were hoping the signal was actually dust. Why were many of the people around you hoping the signal was the result of dust, Jake? So glad you’re back! I’m looking forward to your regular posts again. Congratulations on completing another text book! So the group here could see the signal first with their instrument. Now they probably will, if it’s there. Hello Dr Wile and welcome back. I am a lay person in this field but a while back I was trying to understand the Big Bang and wrote a short article for lay people like myself. I will paste a portion of that article below. As always, I appreciate your thoughts on what I write. The partial article follows. I would like to stress what professor Ellis said about philosophy. Cosmologists are using philosophical criteria to choose their model. They could just as easily choose a different model. No one was there to see or measure the Big Bang as it happen. If it did happen as described, it only happened once. We cannot do repeatable scientific experiments to prove that it happened. All those who choose to accept the Big Bang model must of necessity choose that model of the origin of the universe on the basis of philosophy, not science. The Big Bang model may be the consensus opinion of the majority of cosmologists for the origin of the universe but that doesn’t mean they are correct. Since they are using philosophical grounds to make their choice it is somewhat like choosing a flavor of ice cream. Most people might choose vanilla as their favorite but the person who likes a different flavor more than vanilla has just as much right to make that choice, even though he or she is not in the majority. Choosing a different flavor is not wrong, it is just a different choice than what the majority choose. In the same way, a cosmologist could just as easily pick or develop a different reasonable model for the beginning of the universe if that person had a different philosophical opinion than the majority. As professor Ellis said, it would be difficult to prove that person wrong even if their model had the earth as the center of a spherical universe. Once again, this is not science, it is philosophy. Thanks, Bill. I agree with most of what you have written. However, I would be a bit less sweeping. Cosmologists use philosophical criteria to choose among the models that can be made consistent with the data. There are some models that simply can’t be made consistent with the data, such as a non-relativistic universe. Those models are generally not considered. However, as Dr. Ellis indicates, there are some models that can be made consistent with the data (such as a spherically symmetrical universe with Earth at its center), and those are rejected by most cosmologists on purely philosophical grounds. Thanks for your comment Dr Wile. When I wrote a different reasonable model, near the end of the post, I intended that to exclude unreasonable models. I will try to re write that portion so it is more clear. This may be a bit off topic but in your talk you mentioned the 99% chimp-ape DNA figure was wrong. You discussed comparing the genomes directly and got a much smaller figure (i can’t recall the exact percentage). I recently saw this “Minute Earth” video assuring its audiences that the 99% figure is indeed correct. The argument goes like this: Suppose the genome is similar to the words, letters, paragraphs and pages of a book. A mutation happens when there is a transcription mistake. In our analogy of the book; a mutation could mean a single letter. However, what if the mutation erroneously copied an entire paragraph extra? That would be a single mutation, yet, would consist of hundreds of changes. The movie makes the argument that if you counted each of these mutations correctly the actual number of mutations from ape to human is actually much, much smaller. In fact, when you take the percent change it is conveniently 99%. The video is correct in one way, James. It is correct when it says if you ignore 1.3 billion base pairs (more than one-third of each genome), then yes, the chimp and human genome are 99% similar. However, it claims this is done because a single mutation led to each of these “pages” being duplicated, deleted, etc. However, that’s not really the reason it was done, because there is no way to know that. Those 1.3 billion base pairs are ignored because it is thought they have no function. Thus, they don’t contribute to the differences between chimp and human. However, the ENCODE project showed us how wrong that idea is. The video further claims that using DNA comparisons has helped us understand evolutionary relationships. The fact is, it has confused evolutionary relationships considerably, because the relationships determined with DNA don’t agree with the relationships determined by fossils. In addition, the relationships determined by DNA are not even self-consistent. One set of genes produces one set of evolutionary relationships, while another set of genes produces a different set of evolutionary relationships. Jay, as you wrote, you predicted that “when the BICEP2 data are shown to not provide evidence for inflation, the media attention will be much lower than when the data were thought to provide evidence for inflation.” At rsr.org/big-bang-predictions#inflation we show that Nat’l Geographic’s March 17, 2014 online article, on the BB being Confirmed, had 25,000 “Likes”! Then, their June 22 “Claim Crumbles” article had 51 “Likes”. We didn’t do a comprehensive analysis, but we have no doubt that your second (psychological) prediction was just as spot on as your first (astrophysical) prediction. Thanks Jay! Thanks for that metric, Bob. It seems to confirm what I predicted.